(Nanowerk Spotlight) A caustic is the envelope of light rays reflected or refracted by a curved surface or object, or the projection of that envelope of rays on another surface. A familiar example of optical caustics is the bright line seen in a coffee cup on a bright sunny day. The bright caustic line seen in a coffee cup on a sunny day. Notice that it is brighter below the caustic than above it. The caustic is the envelope of the ray, seen projected on to a horizontal plane. 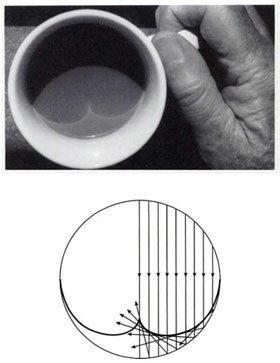 Here the caustic is formed by the envelope of the light rays reflected by the curved surface of the coffee cup. Such concentration of light, especially sunlight, can burn. The word caustic, in fact, comes from the Latin causticus, burning. One of the key requirements for the formation of caustics is the presence of anisotropy – the property of being directionally dependent – in the medium. Caustics are formed in an anisotropic media because the direction of the group velocity and the phase velocity or the wave vector does not coincide. When the anisotropy of the medium is sufficiently large, the group velocity of the waves of a certain wave vector will be practically independent of their wave vectors. In this context, it is well known that magnetic materials are anisotropic in nature and hence the direction of the wave group velocity indicating the direction of energy flow does not, in general, coincide with the direction of the wave vector. Theoretical work by Dr. Veerakumar and Dr. Camley at the Center for Magnetism and Magnetic Nanostructures, University of Colorado shows the existence of spin wave caustics in nanoscale ferrites, ferromagnetic and antiferromagnetic materials. Reporting his work in the journal of Physical Review B ("Magnon focusing in thin ferromagnetic films"), Veerakumar's main findings are that the inherent anisotropy of the ferrromagnets play a crucial role in defining the directions of the burning rays. In addition, the biggest advantage of the spin wave caustics in magnetic materials compared to its optical and phonon counterparts is that the degree of anisotropy can be tuned by applying an external magnetic field and hence the resulting caustic directions are therefore also tunable. In their study, the University of Colorado researchers have investigated the focusing of the magnetostatic bulk and surface waves of dipolar and dipolar exchange waves in nanoscale ferromagnetic thin films as caustics. They have shown that the bulk waves are strongly focused compared to the surface waves. Furthermore, the caustic directions depend on the operating frequency and the magnitude of the external magnetic field. The effect of exchange interaction on the caustic behavior of bulk and surface waves is studied by considering the dipole-exchange waves. 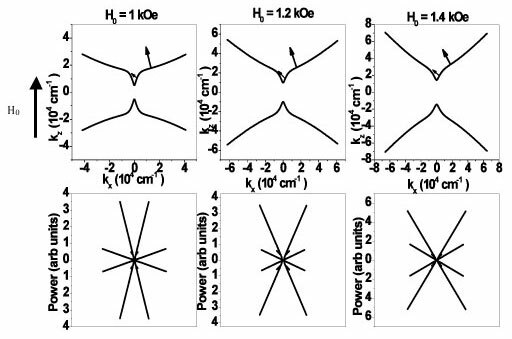 It is found that the bulk caustics are not much affected by the exchange, while the surface modes are strongly focused in the case of dipolar-exchange waves. Recently, Veerakumar has extended his work ("Magnetostatic bulk and surface spin-wave focusing in antiferromagnetic thin films") for another class of magnetic materials called the antiferromagnets. In this case, the bulk waves in the different bulk bands behave differently and for certain specific frequencies and applied field, he found that the bulk waves are focused as caustics. Based on the theoretical results Veerakumar and Camley have proposed a new device called a high frequency 'router'. "Because at a given field, different frequencies are focused in different directions, this could be used to build a device that could separate frequencies behaving like a router," Veerakumar explains to Nanowerk. "As the spin waves in ferromagnetic materials are excited in microwave or GHz frequency ranges, this device will find an important application in radar systems." Also, as the frequencies are focused in different directions in antiferromagnetic materials, this can be used as a frequency router operating at THz frequencies. Recently, the Hillebrands Group at University of Kaiserslautern in Germany has performed critical experiments to study the caustics in ferrites. The results were reported in Physical Review Letters ("Nondiffractive Subwavelength Wave Beams in a Medium with Externally Controlled Anisotropy"), where they found that a narrow source excites caustic spin waves in the film and these caustics propagate along well-defined directions which are controlled by the externally applied magnetic field. The next stages in Veerakumar's investigations are to focus on the design parameters for the GHz and THz frequency router.